Dental lab waxing reservoirs heat and maintain modeling wax at ideal processing temperatures. 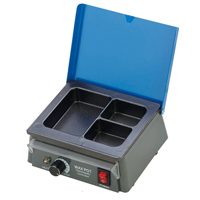 Many dental lab waxing reservoirs offer multiple compartments for different waxes. These compartments can often be removed to reveal one large basin. A lid should be included to keep out contaminants while the wax reservoir is not in use. Some dental lab waxing reservoirs feature a single preset temperature while others are fully adjustable; determine what is necessary for your dental laboratory.